Holly Cottage Self-cateringHolly Cottage is immediately next door to Yew Tree Cottage (Property Ref. 1129) and, being quietly situated at the end of a small cul-de-sac, is ideally placed for a relaxing holiday at any time of the year. With Ambleside centre just a five minute stroll away at the bottom of the hill you will be well placed to make the most of all the village facilities - excellent local shops take care of all your day to day needs and there is a fine choice of places to eat to suit every taste and pocket. Your holiday can be as active or relaxed as you wish - the area abounds in walking for all ages and abilities. The high fells of the Fairfield Horseshoe, Wansfell or Loughrigg Fell can be enjoyed without any need to use the car whilst for easier rambles you could walk 'under Loughrigg' to Rydal or to Waterhead for a cruise on Lake Windermere. The cottage overlooks the grounds of a neighbouring former hotel and is sheltered by mature trees with the distant sound of Stock Ghyll Beck beyond. Accommodation: Covered porch way. Open plan living/dining room with kitchen at one end (TV, DVD, hi-fi, free wi-fi and electric flame-effect stove). Ground floor double room is en-suite (shower, basin and wc). Two further bedrooms upstairs - the master bedroom en-suite has king-size bed and TV (shower, basin and wc) and a twin (TV), together with a third bathroom with bath, shower over, basin and wc. Separate laundry cupboard. This is a spacious property, particularly upstairs where both bedrooms are bigger than average, and it is a real bonus having three bathrooms for six persons including one on the ground floor. Furnishings are comfortable. Fitted carpets throughout. Outside: Private parking for two cars. 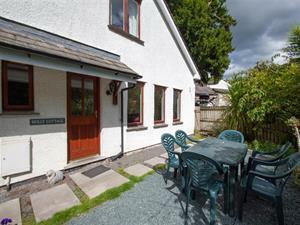 The cottage has its own neat patio area with garden table and chairs provided and a view of Wansfell. Ambleside village centre approx 5 minutes walk downhill. One small pet * non-smoking * duvets/beds made up for arrival * gas central heating and hot water * all fuel included * electric cooker * fridge * small separate freezer * dishwasher * microwave * auto washer/dryer * CD player * free wi-fi * travel cot and high chair available - please order * towels available - please order * private parking for two cars. Holly Cottage is immediately next door to Yew Tree Cottage (Property Ref. 1129) and, being quietly situated at the end of a small cul-de-sac, is ideally placed for a relaxing holiday at any time of the year. Holly Cottage offers weekly bookings starting on Saturday.